McAuley Ministries serves the Pittsburgh neighborhoods of the Hill District, Uptown, and West Oakland. Workforce development that links training to family-sustaining jobs. Youth employment initiatives that introduce young people to careers and foster a strong work ethic. Business incubators that support emerging resident-owned businesses and link entrepreneurship to market opportunities, resulting in job growth and wealth-building. Evidence-based initiatives that help families address the key barriers to self-sufficiency. 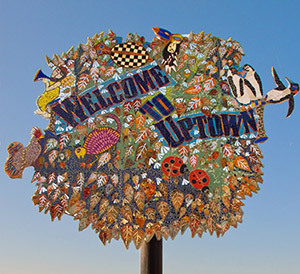 Neighborhood initiatives that enhance community aesthetics and cultural vibrancy. Travelers Aid provides six months of transportation assistance for residents during training and employment. Travelers Aid provided K. with a bus pass to travel to classes at the Energy Innovation Center, and to her new job at UPMC, working the 10pm – 6:00am shift. J. is in his final semester of the Heating and Air Conditioning Certificate at CCAC and needed to take his last class at the West Hills Center which is in Oakdale. J. does not drive and needed to take the bus to get there. Being able to provide a pass for him has made it so much easier for him to get to West Hills and knowing it was paid for was a huge relief. Martin Luther King Community Garden was established several years ago, but recently had become overgrown with weeds. The garden is a converted baseball field, and when the SCA crew started there was a single 10×20 plot under cultivation. Over the course of the summer the crew re-established all of the beds and covered them with enviro-cloth. They also pulled down vines from the fencing and added a trail to allow access from a nearby neighborhood that was cut off from the garden. The MLK Community Garden Volunteers will now take over stewardship of the space and hopes that community members will be more enticed to join the garden now that it looks like a garden instead of an abandoned lot.